We’ve all been there, brush in one hand hair dryer in the other – now what? I’ve been a stylist for many years, but in the beginning I can remember having the same thought. It took me almost two hours to do a blowout when I first stated. After a lot of practice, I finally learned how to blow dry hair fast; I can have hair from wet to dry in 30 minutes or less and so can you! When I was training in New York City I studied under some of the best stylist in the industry who taught me their tips and secrets to achieving the perfect blowout. 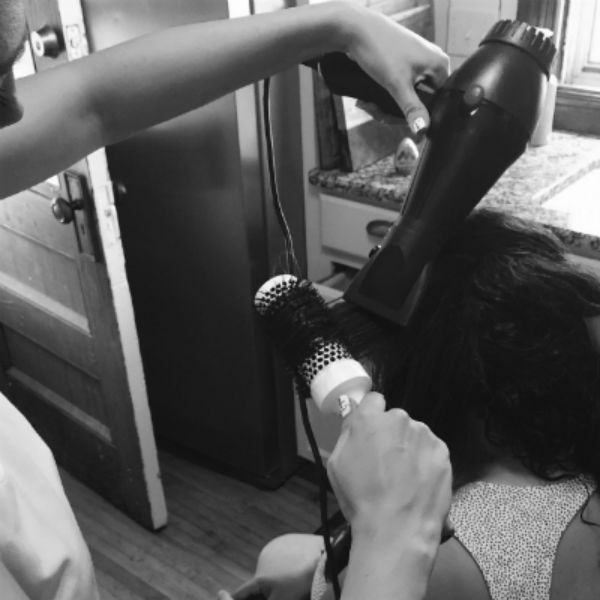 Now I’m here to pass these tricks on to you so you can create a salon quality blowout at home. You may get hot, frustrated and tired, maybe even shed a tear ( I had many tears at first). But with my help and your practice & patience you will be able to tame your locks in no time. Just stay strong and stick with it. I’m going to break down step-by-step what you need to do to accomplish the beautiful hair of your dreams using a hair dryer, a round brush and a lot of patience. Don’t Be Afraid To Pre-Dry Your Hair Before Sectioning – Pre-drying your hair will help you cut down on drying time. Once you practice enough times with your hair you will learn how much you can pre-dry before you start to round brush your hair. The average amount for most hair textures in 50%. Of course, if your hair tends to get very frizzy very fast you don’t want to pre-dry it as much. Divide And Conquer – Now it’s time to section your hair. It’s very important to have neat, clean sections. Keeping your sections straight and neat will allow you to not get lost in your hair and have a consistent lift at your roots. Make Sure You Keep Tension – When blow drying your hair, you must always keep tension on the section you have around your brush. Without proper tension, your hair will frizz. When coming to the ends of you, hair make sure you roll your brush and pull it all the way through till your ends fall off the brush. By doing this, you will seal your ends making them look healthy and smooth. Finishing Touches – Once you have all of your sections dry you need to let your hair cool down before you touch it. Touching your hair when it is still hot will cause it to fall flat and lose it’s shape. Give you hair at least 5 minutes to cool. I like to do my make-up and have a cup of coffee while my hair cools down. Once cool run your fingers through you hair to blend your locks together. Sometimes I like to give my head a flip upside down for an extra va va voom. Spritz with hairspray for a little hold and you are done! I have medium lenght hair between fine to coars and would love to have the volume and shine has i blow dry them instead i get the lion hair!! I have the t3 blow dryer would you have tips for me please.